My second build - the BYOC 250+. I built it to original DOD 250 specs, so it's just an overdrive. This was a very easy build, about as difficult as the confidence boost but adds the LED and 3PDT switch. Went together in about three hours from start to finish. The only minor screw-up was that i inserted the LED backwards and it didn't light. So I desoldered, flipped it around and bang - done! I tried a thinnner gauge of solder than I used on the Conf Boost and it made a huge difference - much easier to work with on the PCB. Rather than paint something flashy I decided to just polish the enclosure - I hit it hard with 320-600-1000-2000 dry to wet and it came out pretty well. Smooth as glass. It sounds great! 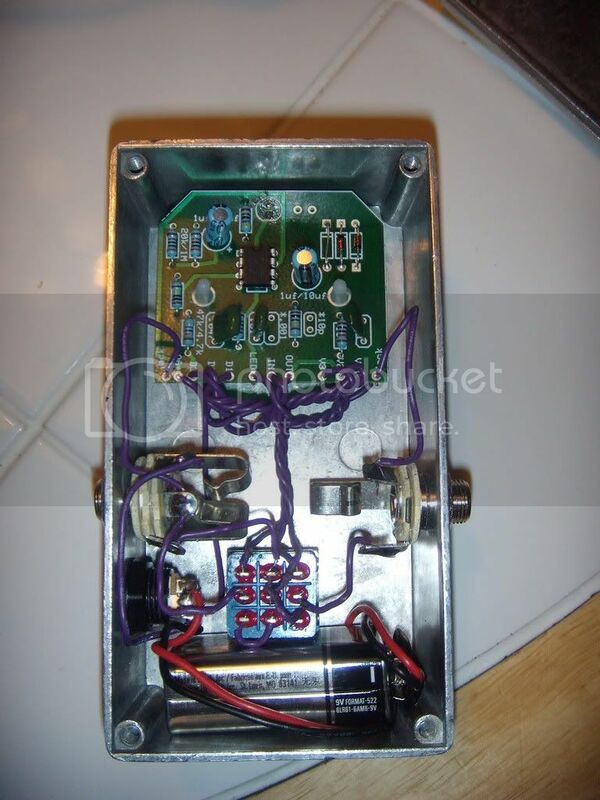 Very simple yet effective overdrive. My plan is to see if I can get more gain out of it, and add a switch to go between the original resistor(s) and whatever new resistors I might need for the higher gain. Then the fun really begins.